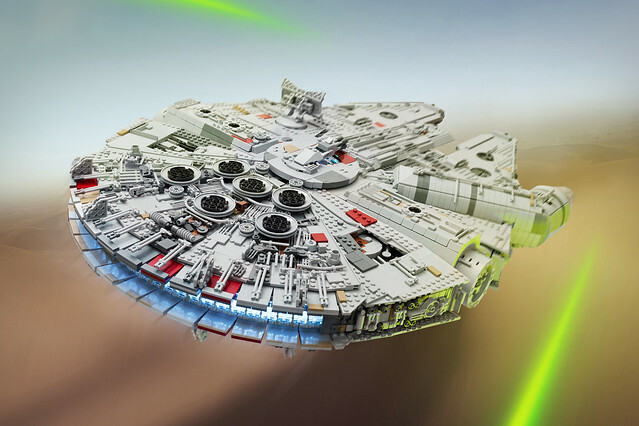 I half joked in my post about improving Rey’s speeder that my next project would be to mod my 5,000-piece UCS Millennium Falcon set into the version seen in Star Wars: The Force Awakens. marshal banana planned a bit more ahead of me, and has spent the last year planning, designing, gathering the LEGO parts, and building his own Millennium Falcon from Episode VII. 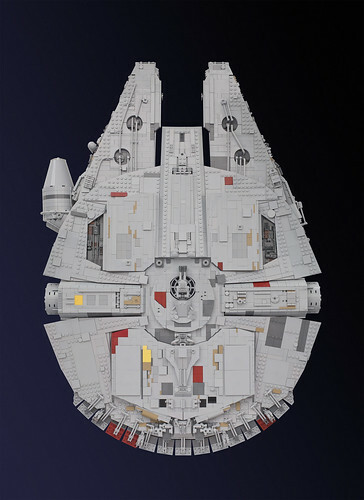 At 7,500 pieces, Marshal’s Millennium Falcon uses fully 50% more parts than the 5,195-piece official 10179 UCS Millennium Falcon (the second-largest LEGO set ever sold by part count, and arguably physically the largest set ever). 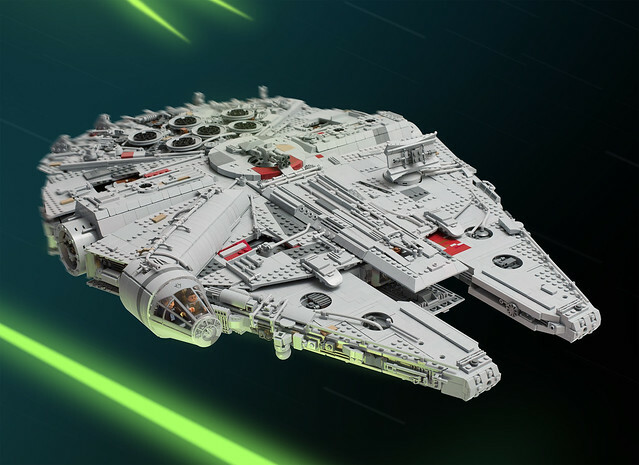 This LEGO Millennium Falcon measures 82 x 54 x 18 cm, or nearly three feet long. While the internal structure required to make the model light enough at 10 kg (22 pounds) but sturdy enough to pose at an angle like this doesn’t allow it to have a full interior, it does have light-up engines and gun wells. 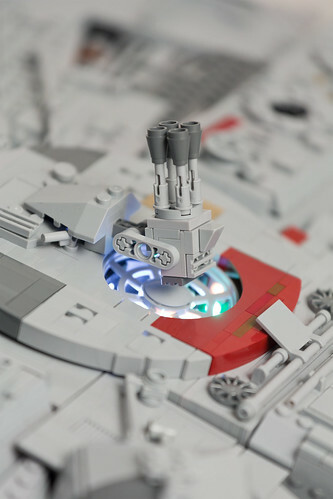 One of the most noticeable differences from the official LEGO set is the change to the sensor panel, as reflected in the minifig-scale Millennium Falcon I reviewed recently. 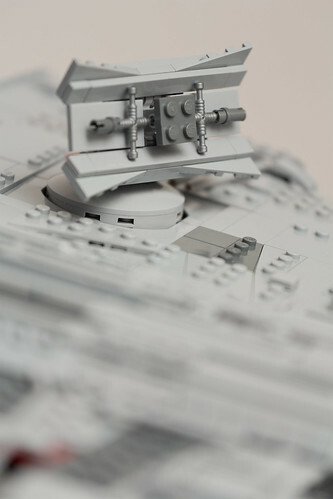 And here’s another shot of the light-up quad cannon emplacement. It’s clear from this top-down photo that the builder has spent some significant time with various reference materials — the plan view shows just how closely his model lines up to the shape and details published in books like The Essential Guide to Vehicles and Vessels. 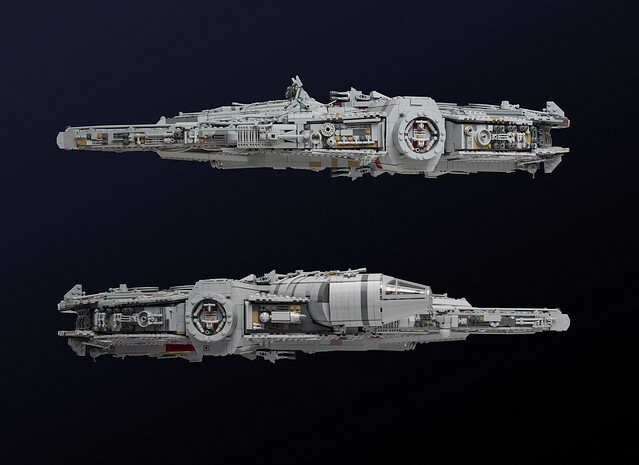 Unlike the fairly bare belly of the official LEGO set, Marshal Banana’s version has a fully detailed underside. 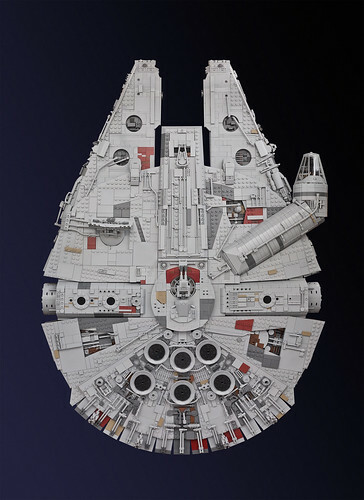 Similarly, I’m deeply impressed with Marshal Banana’s greebling, which is particularly evident along the sides of the Falcon — it’s hard to look intentional without looking totally random. I just wanted to show off what Heather got my for CHRISTmas! !